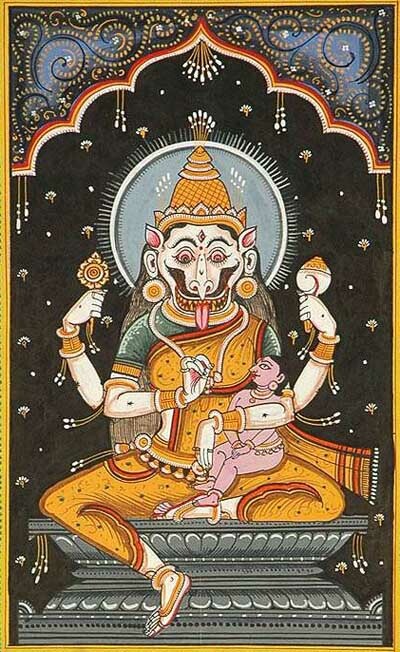 Narasimhi is an incarnation of Mother Goddess that is associated with the Narasimha avatar of Hindu God Vishnu. She is also popularly known as Goddess Pratyangira. There are two schools of thought regarding the origin of Goddess Narasimhi. The Vaishnava School of thought suggests that Goddess Narasimhi appeared from Goddess Lakshmi me to keep in control Narasimha whose fury was about to engulf the universe. The Shaivite School of thought suggests that Goddess Narasimhi is an incarnation of Goddess Shakti and she appeared from the wings of Sharabha – the form Shiva took to subdue the anger of Narasimha. Narasimhi has the face of a lion and she has four arms. One of the ancient temples associated with Goddess Narasimhi is located at Aivar Padi near Kumbakonam in Tamil Nadu. Here the deity is popularly known as Pratyangira Devi and has 18 hands.